Hammertoes are contracture deformites of the toes where the toe bends abnormally at the joints. 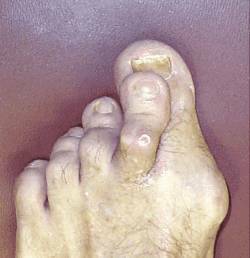 Some people will start to develop symptoms secondary to hammertoe deformity which may affect one toe or multiple toes. Since hammertoes are essentially a bone and joint deformity, surgery is the only way to correct the deformity. Surgery varies on the severity of the hammertoe deformity and which toe is involved. Often the 2nd toe (toe next to the Big Toe) can become painful after a long standing deformity and can progress over several years to a fixed deformity. A fixed hammertoe deformity cannot manipulated to a straight toe. This often leads to needing surgery to correct the hammertoe. Correction of a fixed hammertoe deformity involved removal and fusion of the joint in order to straighten the toe. The fusion site can be stabilized while it healed with either surgical pins that are left inside the toe or many cases where the ends of the pins are outside the end of the toe and are removed at 6-8 weeks following surgery. Depending on the severity of your hammertoe deformity your surgeon may perform your hammertoe correction utilizing a toe fusion implant that stays buried in the bone. For hammertoe correction of the 5th toes, the procedure often only involves removal of part of the bone from the joint which relaxes the contracture of the toe and provides relief of symptoms such as corns or calluses. As always, discuss your options with your surgeon and remember to follow their instructions postoperatively to ensure the optimal outcome for your surgery.